In tennis, it’s easier to serve than to return — you dictate the first move, you control the opening stroke, you set the tone for the point, which, in turn, can set the tone for the game, the set and ultimately the match. And when Maria Sharapova took it upon herself Monday to announce she had failed a drug test at the Australian Open in January, she was basically serving and setting the tone for a match she’d probably rather not play. Sharapova at the Los Angeles news conference confessed to what she described as an honest mistake: For a decade, she had been taking a drug called meldonium, purportedly for health issues, that was added to the list of banned substances in January. Getting out in front of negative news is PR 101, and Sharapova’s move was a classic and effective execution of that time-tested approach. Almost immediately, however, major brands suspended their sponsorships with the Russian tennis star, the top-earning female athlete in the world. But her move was still the correct one, public relations experts said, an effective first shot toward swaying the court of public opinion and keeping her in the endorsement game while working toward softening the blow of any impending suspension from tennis. Soon after Sharapova’s news conference, when she said she received a letter last week alerting her to the situation, the International Tennis Federation (ITF) confirmed the failed test and said Sharapova, a former world No. 1 tennis player and five-time Grand Slam champion, was provisionally suspended as the case was investigated. That set the stage for several marquee brands to suspend — but not terminate — their relationships with Sharapova, who earned an estimated $29.5 million last year, the vast majority of which came from endorsements. Nike Inc. was the first domino to fall, followed by the Porsche AG unit of Volkswagen AG and the TAG Heuer SA unit of LVMH Moet Hennessy Louis Vuitton SE. While it wasn’t Sharapova’s finest moment, Bernstein said, he likely will use it in the future as a case study of a bad situation handled well, that is, barring bombshell news that suggests she was not completely forthcoming in her admission. 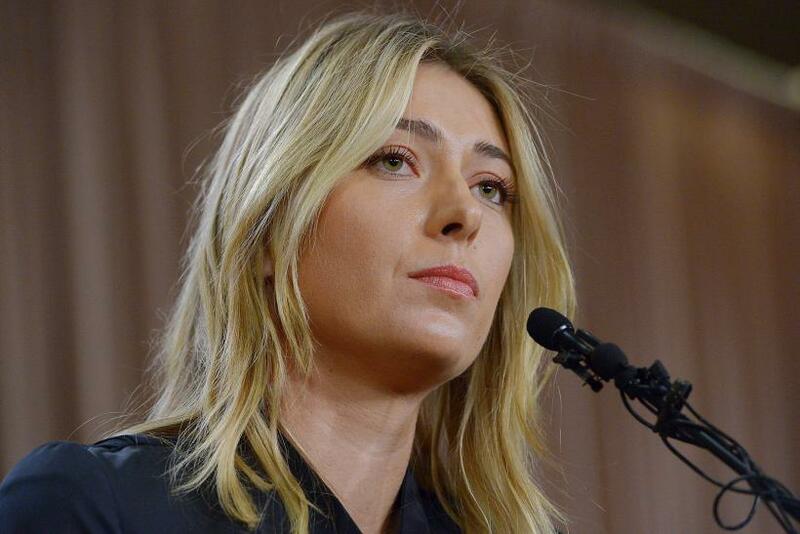 During the press conference, Bernstein said, Sharapova was generally perceived as conciliatory and forthright. “I made a huge mistake, and I let my fans down, I let the sport down that I’ve been playing since the age of 4 that I love so deeply,” Sharapova said. “If she had no idea [meldonium] was a banned drug ... most people would perceive that as a technical foul as opposed to an intentional foul,” Bernstein said. This strategy has the potential to backfire, however. The Associated Press reported Tuesday that the Latvian manufacturer of meldonium — banned in January by the World Anti-Doping Agency because of evidence it had been abused by athletes in an effort to increase endurance — said, depending on the patient, it is typically taken between four and six weeks, from two to three times a year. Sharapova said, at the behest of a family doctor, she had taken the drug since 2006 for reasons such as getting the flu frequently, irregular electrocardiogram results and indications of diabetes. The drug helps with blood flow and is a common heart medication in the countries of the former Soviet Union, but it is little known in the U.S.
Sharapova’s story surrounding the failed test is still in its infancy. But, in the court of public opinion, her narrative is the base on which all parties are now working, including herself, the brands she endorses and the ITF. It may represent the difference between the public hearing an excuse and it hearing an explanation. Morals clauses in endorsement contracts typically leave some wiggle room for companies to abandon athletes when scandals emerge, said Brian Socolow, a sports law expert and a partner at Loeb & Loeb LLP in New York who has experience negotiating endorsement contracts. In the wake of Sharapova’s announcement, concerned sponsors have been left to ride it out, merely suspending their relationships with her while awaiting more information. “Often when an athlete makes a mistake and runs up against a morals clause, they position themselves to get a second chance with the public: That’s what Maria Sharapova is doing,” Socolow said. Sharapova has been the top-earning female athlete for 11 straight years, according to Forbes magazine’s rankings. Scott Bukstein, associate director of the DeVos Graduate Sport Business Management program at the University of Central Florida in Orlando, said with Sharapova’s high profile and proven cunning in marketing, she could one day move to leverage the mistake into an endorsement narrative centered on second chances and educating the public about such mistakes. However, Sharapova has increasingly suffered from injuries in recent years and is 28 years old in a sport that wrecks knees and is typically dominated by younger players (even more so than other professional sports). When failing tests for performance enhancing drugs, players typically expect a two-year ban for unintentional use and a four-year ban for intentional use. At Sharapova’s age, even a two-year suspension could potentially conclude the career of an injury-prone player. But bans for substance infractions have varied in tennis. A list compiled by the Press Association in the U.K. detailed a number of recent high-profile suspensions ranging from four months to two years. One of these cases could provide Sharapova with hope: Marin Čilić was banned by the ITF in 2013 for just nine months after a drug test found traces of a banned stimulant, which he blamed on an over-the-counter supplement while arguing that only a by-product of the banned substance was found. His suspension was eventually reduced to four months at the Court of Arbitration for Sport, and Čilić won his first Grand Slam title the next year. Sharapova’s lawyer John Haggerty has already indicated to ESPN that he believes there are “mitigating circumstances” that should make the star’s ban much less severe. And Sharapova’s news conference, while just the first step in what is likely to be a long process, should help win over the public, which, in turn, will affect the people making the decision on discipline, experts said.